CIO, CTOs and IT managers face the challenge to manage hundreds, or in some companies thousands of technology products. 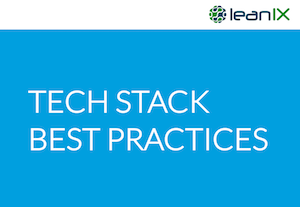 In order to cluster technology in a meaningful way, we use the Technology Stack at LeanIX. IT Components (Technologies) are assigned to a specific Technology Stack and therefore categorized. This makes analyses easier and allows for prioritization. For example, it is easier to focus on middleware technology for a detailed cost analysis, rather than trying to assess cost saving potentials for hundreds of different IT Components. Experience shows that companies struggle with finding a good structure for their IT Components. A good Technology Stack puts IT Components in useful categories that are neither too broad nor too narrow. Therefore, a good structure is also dependent on the number of IT Components that are to be clustered. We propose three different Tech Stack variations as a starting point – from very lean to very detailed. Download three different Technology Stacks here. Reach out to us in case you want to receive the templates to load the Tech Stacks in LeanIX.